New #ODimpact Release: How is Open Data Creating Economic Opportunities and Solving Public Problems? – Open Data Aha! Home › Benefits of open data › New #ODimpact Release: How is Open Data Creating Economic Opportunities and Solving Public Problems? Proponents of open data have long argued that the release of government information to the public could result in meaningful impact for citizens. To date, though, little evidence has demonstrated the real-world impacts of open data. Indeed, the field has lacked a taxonomy or framework to help measure and assess the effects of the broad range of open data initiatives underway around the world. 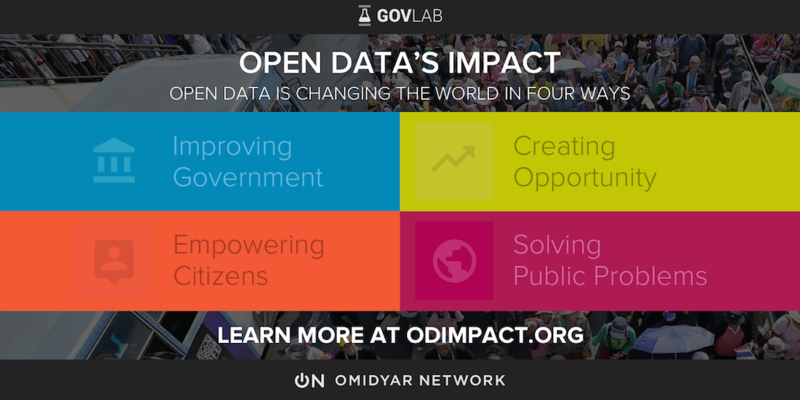 Last month, the GovLab and Omidyar Network launched Open Data’s Impact (odimpact.org), a custom-built repository offering a range of in-depth case studies on global open data projects. The initial launch of the project featured the release of 13 open data impact case studies – ten undertaken by the GovLab, as well as three case studies from Becky Hogge (@barefoot_techie), an independent researcher collaborating with Omidyar Network. Today, we are releasing a second batch of 12 case studies – nine case studies from the GovLab and three from Hogge. The GovLab case studies were developed through a combination of secondary sources and more than 60 interviews with stakeholders involved in the projects under examination. Each case study provides a narrative description of how the open data project was developed, an examination of its real-world impacts, an assessment of the challenges faced by its organizers, and, finally, an examination of next steps and future directions for the project. Upon completion of initial drafts, the GovLab undertook a first-of-its-kind open peer review process, during which dozens of individuals provided input on the 19 case studies. The GovLab also prepared a Key Findings paper that draws together lessons from all the case studies; this paper will be released in March. All of the case studies are available at Open Data’s Impact in both PDF and machine-readable HTML format, and users can browse the repository by area of impact, sector and now also region. Open data is improving government, primarily by helping tackle corruption, increasing transparency, and enhancing public services and resource allocation. Open data is creating new opportunities for citizens and organizations, by fostering innovation and promoting economic growth and job creation. Open data is playing a role in solving public problems, primarily by allowing citizens and policymakers access to new forms of data-driven assessment of the problems at hand. It also enables data-driven engagement, producing more targeted interventions and enhanced collaboration. The coordinated sharing of data among government and international actors during the response to the Ebola outbreak in Sierra Leone. The identification of discriminatory water access decisions in the case Kennedy v the City of Zanesville, resulting in a $10.9 million settlement for the African-American plaintiffs. Increased awareness among Singaporeans about the location of hotspots for dengue fever transmission. Improved, data-driven emergency response following earthquakes in Christchurch, New Zealand. Troubling privacy violations on Eightmaps related to Californians’ political donation activity. With this second batch of case studies, the GovLab has now completed the release of its 19 peer-assessed open data case studies from around the world. In March, we will release a Key Findings paper describing the lessons learned across all the cases. This paper will also include a set of recommendations for policymakers, decision makers and other considering how to achieve maximum—and positive—impact from open data projects. In the meantime, we look forward to your comments and thoughts on these and the previous case studies.